I didn’t realise it at the time but I think that it all started to go wrong with the chocolate milk. The night before my chemo I forgot to have my usual glass of cold, sweet milk. I read somewhere that it helps you prepare for the onslaught of cancer-kicking chemicals. Not sure how much science there is to that but it’s a comforting routine. It was dark when we set out for the hospital on Tuesday morning. My aunt Judy was driving us. She was a games maker driver for the Olympics so I knew I was in safe hands. But the miserable weather and sloooooow traffic jams seemed determined to conspire against us. Then I remembered about the missed milk. I knew it was going to be one of those days. 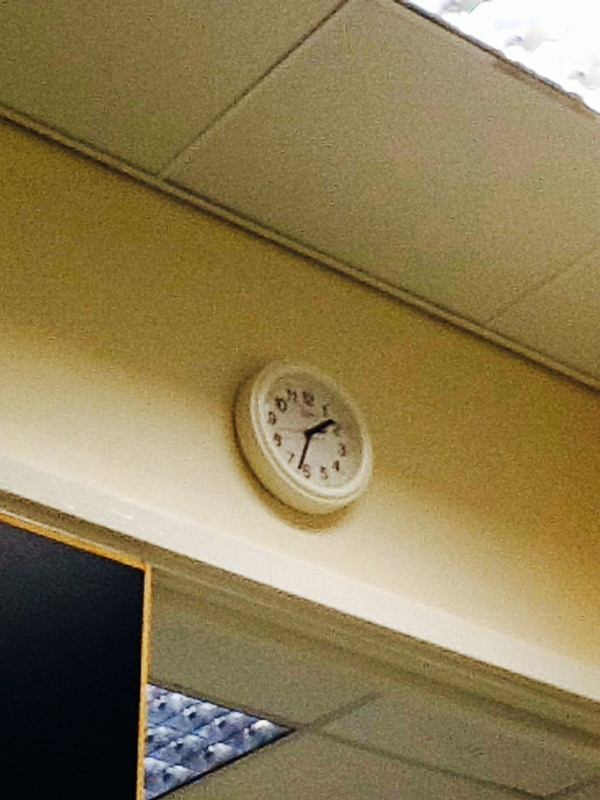 When we arrived I noticed that the room on the chemo ward, which was to be my base for many hours ahead, had a stopped clock. That just about summed up how I felt. If you’re not ill, you may think that its terrible what I’m going though. It is. But I also get to see the other side. At hospital there are many people who are far worse than I am. Clearly it means that there are sometimes emergencies and delays which can’t be predicted. I don’t mind waiting, I’m just relived that its me left sitting there, instead of causing the consultants to come rushing off through the corridors. I was told that my blood count was really good. It means my body is coping with the savage chemo regime and my immune system is recovering well in-between the sessions. The only problem is with magnesium. As always, it seems, this is far too low and I needed a bag of it via the IV drip. That added on another two and a half hours before the chemo kick-off. And so it went on. But there was no drama for me, thankfully. Instead I had wonderful friends to entertain me who brought cakes, presents and gossip from the outside world. I feel so very lucky to have the support of lovely family and friends. And I’ve saved the best for last. I had my first set of test results since the start of my latest lot of toxic cocktails. 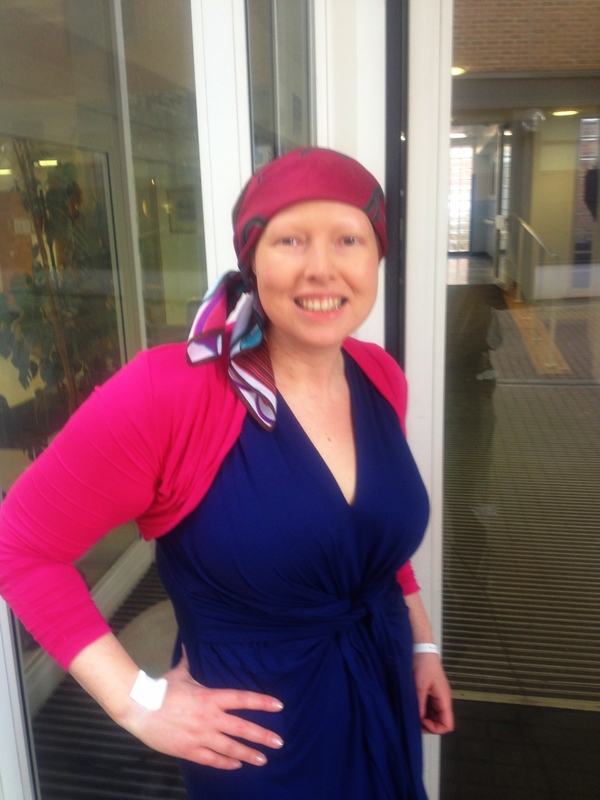 Big drum roll…..They show that the chemo is working!!! After just one session of chemo, the tumour marker tests called the CA125, has dropped by a quarter. It’s amazing news and will help me get through all the horrible side effects to come. I’m already half way through my treatment. Just three more to go. Hooray! 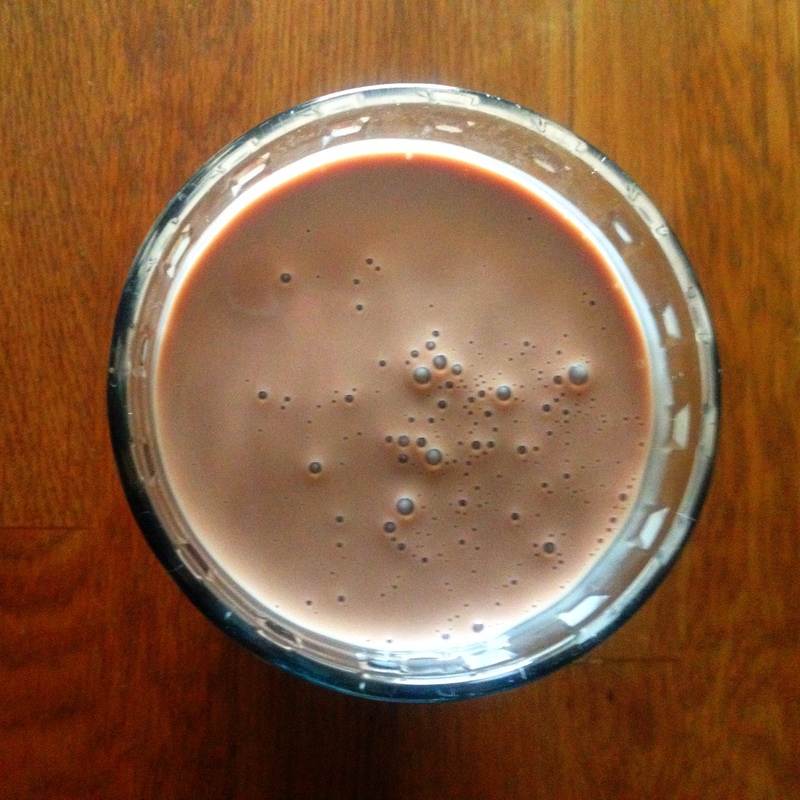 Back home after a marathon 11 hours at hospital, I finally got that cold glass of chocolate milk. It was a sweet celebration. Oh, by the way, happy 100 to me! This is my 100th blog post. I never thought I would do so much blogging. But continuing to blog means that I’m still here and still going strong. Thanks for reading and being there for me. It was a room without a view but I wasn’t complaining. Once again I’d been upgraded. I had my own private room. It came with a bed and an isolated sense of calm. Stark and clinical, it was such a contrast to the country pub where I pulled a pint from my List for Living, a few days ago. I knew I was in for a long afternoon. My magnesium levels have got so low that I needed to go on a drip of the stuff for two and half hours before I could even start the anti-cancer drugs. Luckily I had company. My friend Keith came for chemo coffee although it turned into chemo coffee, lunch and tea. He was well prepared. With sushi and sandwiches and cream cakes, he laid on a hospital bedside banquet. When I’d walked onto the ward earlier, I hadn’t really looked at the other patients. In my little room, Keith kept me entertained with a laptop stuffed with movies. It felt like a lovely lazy afternoon albeit in slightly strange surroundings. I could almost pretend that I wasn’t being pumped full of poison. Normally just being there, surrounded by sick people and all the medical equipment means that you focus on the cancer. It’s hard to avoid it. Yesterday I also had a visitor – a fellow patient from my previous lot of treatment last year. We had got to know each other quite quickly as most of the other people at hospital are about twice as old as us. My chemo sister is totally fab-u-lous. She is positive but pragmatic and ensures that she looks amazing at all times. Something that takes an admirable effort. My chemo sister came to see me with something sweet. A sparkling chocolate cake that she’d baked herself. Me and my steroids were very happy to be taking home that beauty. By the time I was unhooked from the drip, the ward was almost deserted. My session at the chemo cocktail bar had left me a bit dizzy and almost like I was drunk. Probably thanks to the pre-meds. I also felt surprisingly well. I reckon that was mostly because of my afternoon with friends and the chemo-cake-therapy. Despite the hours of treatment, it had been easy to forget about the cancer. Sometimes a little dose of denial isn’t a bad thing. For my second week of treatment I was out for lunch. No,really, I went out for lunch half way through my chemo day. I escaped from hospital although I did it with permission from my nurse. Weekly chemo is supposed to be quick and easy. Ha! That’s more hope than reality. The day starts with blood tests; this is to prove I’m well enough for what’s to come. It takes about half an hour for the results to come through. It’s only once the doctors get these, that my order is put in at the chemo cocktail bar. The clear liquid has to be mixed. Shaken not stirred. This then has to be delivered to the chemo ward. The process takes around a couple of hours. 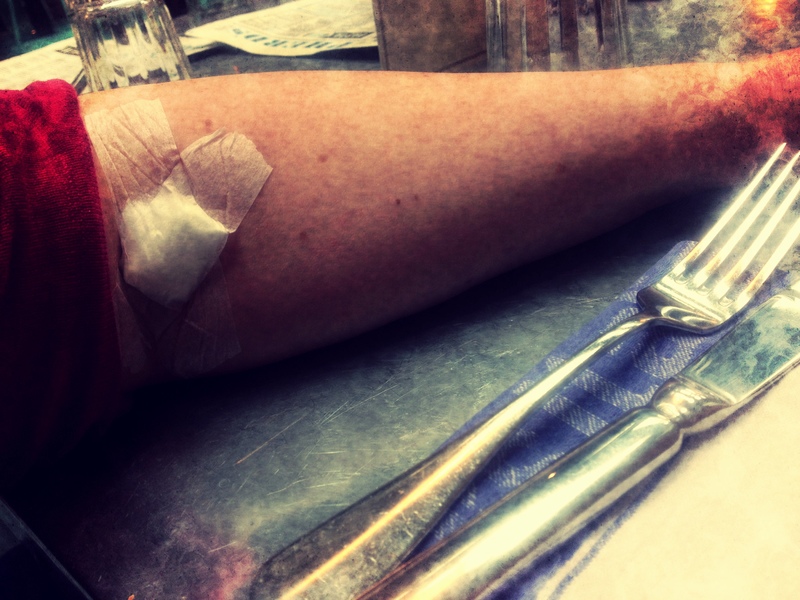 As I knew that there was a long wait ahead, I decided that the best time to leave would be straight after the blood tests. I snuck out with Mum and my Aunt Rose who’d come up to London to keep me company. My friend, the blogger joggingjenny, also joined us although instead of running there, she did actually get the bus! For a couple of hours I was free. For a stressful day, it was lovely to go out for lunch. It took my mind off things. I wasn’t surrounded by medial sights and smells. Plus Jamie Oliver has a far better menu than the hospital canteen. It felt strange, almost like I was skiving from school. Afterwards I was able to start my treatment with a really upbeat mood. That lasted about oooh a few seconds until the moment the needle went into my hand for the IV drip. “I just need to push it in a bit further,” my nurse kept repeating. Before I had Tamsin promising to pinch me as a distraction, this time I thought of yellow. Bright, warm, sunshine yellow. It may seem odd but I’ve been reading an interesting book called The Yellow World by Albert Espinosa. He had cancer as a teenager and is now in the clear. But not before he had more than 8o sessions of chemo. In total I’m only on number 14. The Spanish author has a big thing about the colour yellow. He reckons it’s very special. 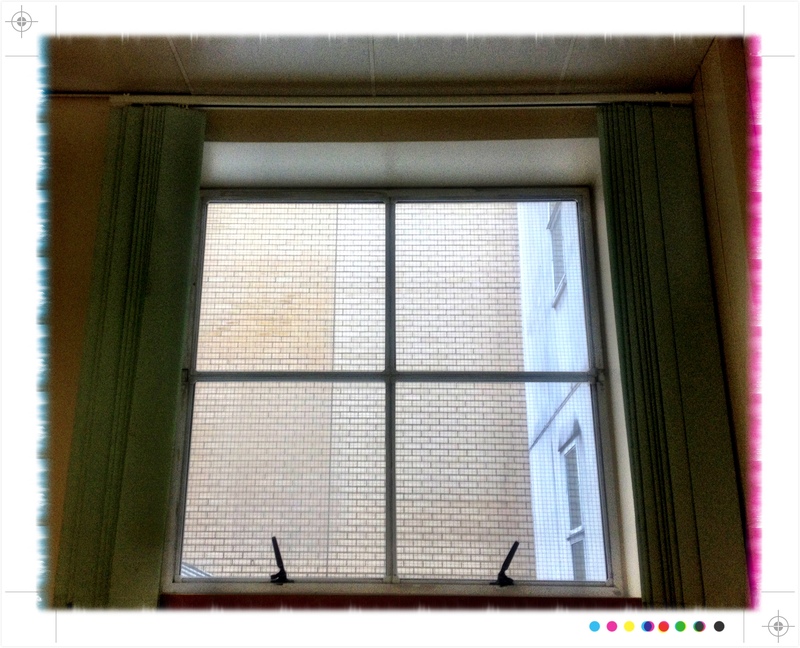 As I looked away from the nurse I saw a woman in a yellow jumper…maybe he’s onto something. Albert Espinosa also believes that if you think – this will hurt – then it will. Following his advice, whenever the word pain popped into my head, I replaced it with pavement because it’s a word that’s totally unconnected with pain. And it worked, a bit. 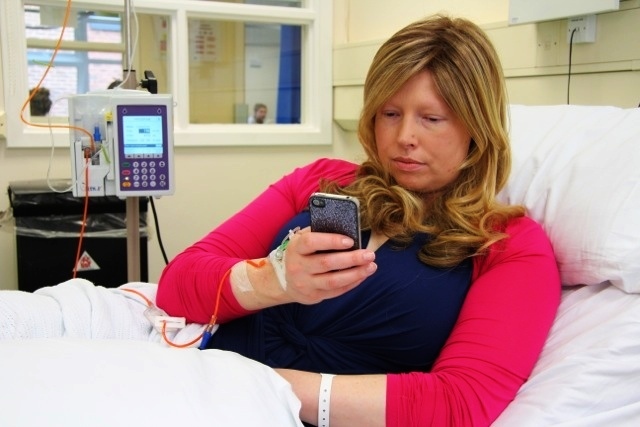 As the drugs started to flow, my friend Louise stopped by for the chemo coffee club. With a posh paper bag, she came carrying contraband. 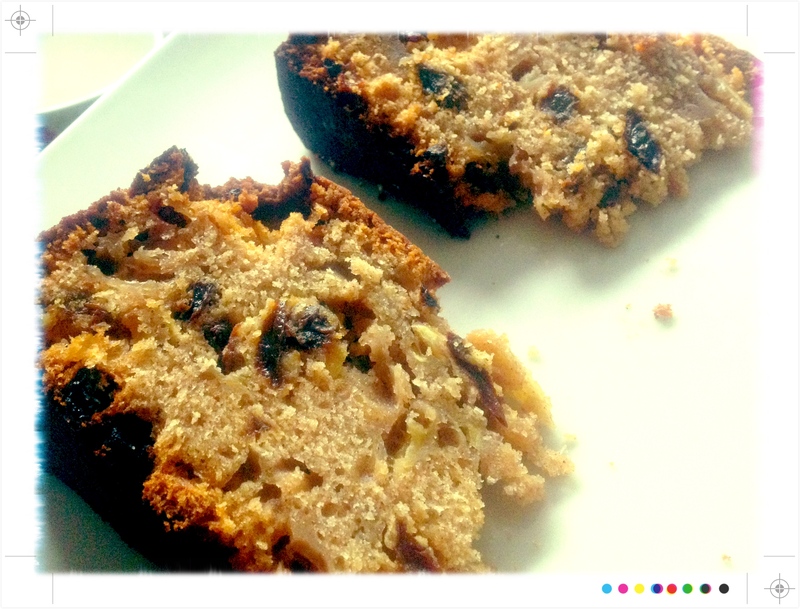 Louise broke the no-cake-it’s-chemo-again rule! The fancy cup cakes been sprinkled with blue sparkles and were inside a box tied with a long pink ribbon. I’m trying to be super healthy but the cakes tasted amazing so all was forgiven. 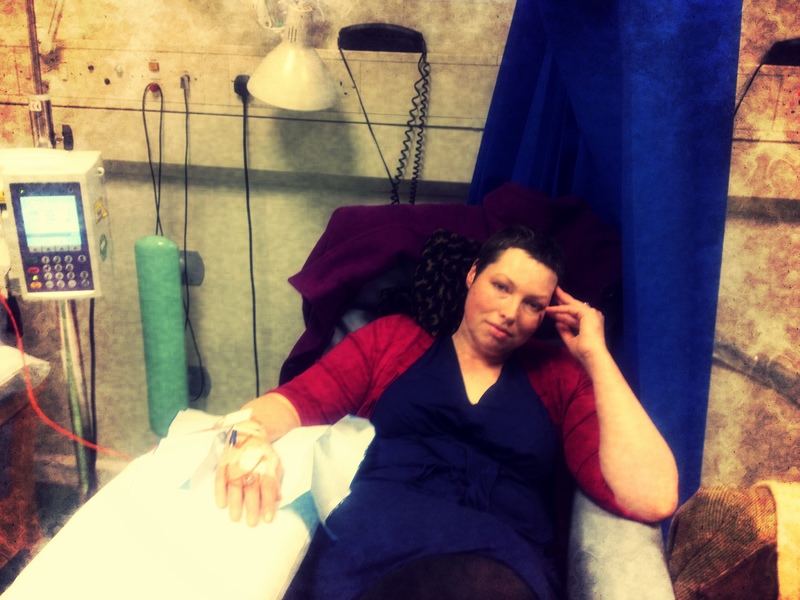 However just being there, squashed into a small cell of the stuffy chemo unit, made me want to cry. I was so tired and my hand was in real pavement. It was that bad I had to take my wig off. One thing that helped me was a comment on my blog from a woman called Mary, who I think is from Australia. She was told she had five days to live. She was given some advice by a woman in the next bed to her who was also dancing with cancer. Now three years on she wanted to share this advice with me. First of all try to think of chemo as your friend, as something incredible, like liquid gold flowing through your veins. Yet more yellowness. Accept it and welcome it. Secondly, instead of thinking why me? She suggests that it may be more helpful to try considering, why not me?? She’s right. I’m coming to realise that self-pity is such a waste of valuable energy. I’m sure that no-one thinks that they deserve to get this killer disease. But I have it and I need to focus on the fight. Then something terrible happened on the ward. A patient near me had a serious reaction to the chemo. The drugs are so toxic that there is always the chance your body will reject them with frightening consequences. After some emergency care the paitent was fine. Not well but no longer in danger. While the only problems I had came from my hand hurting thanks to the drip and the side effect of sleepy drunkenness. I didn’t say a word about them. I’m just so grateful that my body is still strong and can take the kicking it’s getting from the chemo. Long may this continue. Now that my treatment has finished the doctors need to make sure that I really really have beaten the stupid cancer so I had to go back to hospital for a scan. I’ll get the results next week. While I was there something happened which was a bit strange. I started to meditate. I was sat in a changing room the size of a big cupboard at the imaging unit dressed and ready for my appointment. I’ve had so many scans over the years that I know how to properly tie those pesky medical gowns so that everything is covered. With its familiar sights, sounds and smells, just being in the hospital was horrible. I needed to relax. As I waited, I began meditating. I counted my breath in and out, trying to ignore the noise around me. That was until I heard something which sent my heart racing. An alarm was going off in the next room. The loud bleeping sound meant a patient had stopped breathing, just like I had following surgery. It was a false alarm but it took me straight back to that time when I was so close to death. I opened my eyes, giving up on the mediation and feeling more stressed than ever. Not long afterwards a man with tattooed arms came and got me. It was time to be scanned. So why the sudden interest in meditation? All my medical treatment is over. Yes, I’ll have check-ups and routine tests but aside from that I’m on my own. I want to do more than just hope it doesn’t come back. 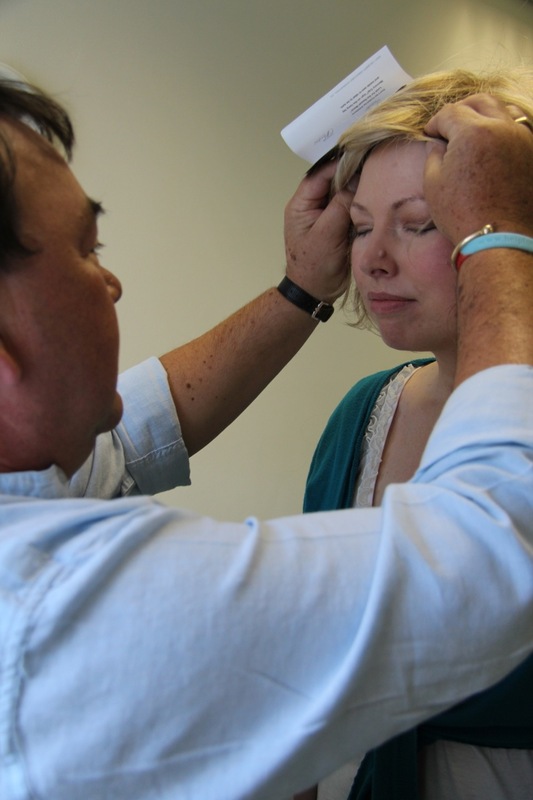 During the chemo I had some less conventional treatments like acupuncture and hypnotherapy. They seemed to help ease the nasty side effects. I thought I’d try some more complimentary methods and last week I went on a course at a holistic centre for people dealing with cancer. I have to admit that part of me was sceptical however I’m willing to try anything. Even so, I did smuggle in some sachets of coffee. We’d been told that the menu would be ultra-healthy and there’d be no caffeinated drinks on offer. I thought I might need my own supply and I was right. 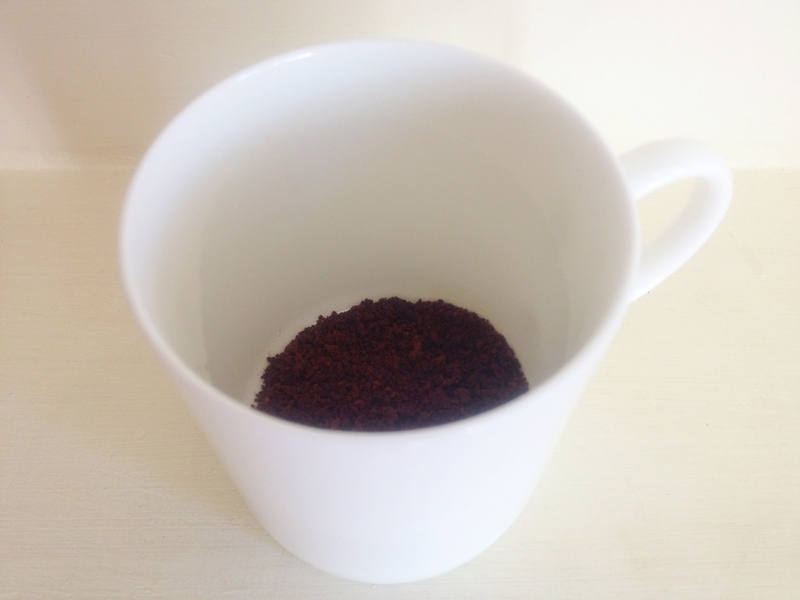 One of the coffee substitutes was something called Slippery Elm! 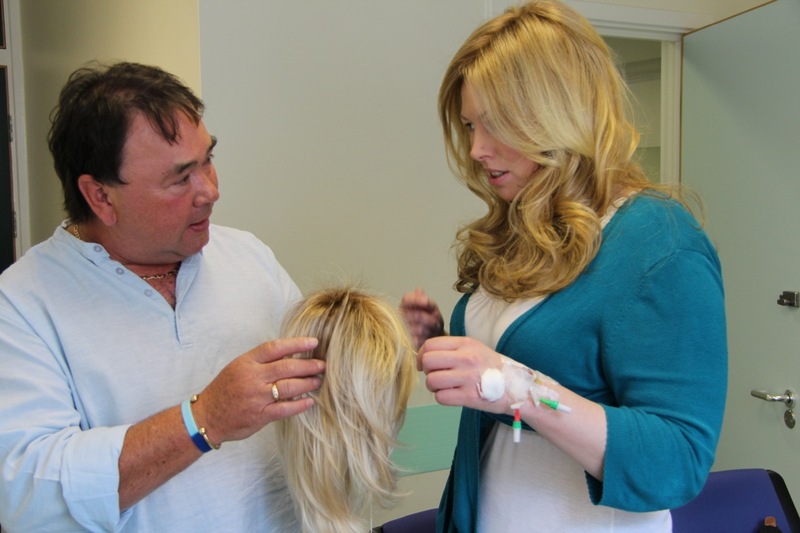 The course at the Penny Brohn Cancer Care centre took place over three days. Inside the Georgian building it felt like a cross between a hotel and a posh hospital, outside there were acres of landscaped grounds which overlooked a river. 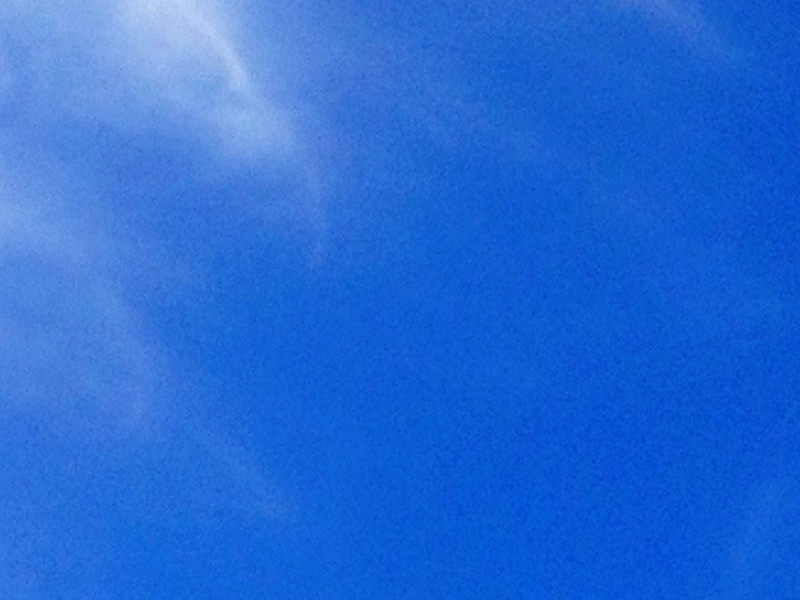 With bright blue skies and dazzling sunny weather everyday, it was uplifting just being there. It was almost like a health spa for cancer fighters. Based on the edge of Bristol, the place helps people live as well while coping with the impact of the deadly disease. The charity was set up in the 1970’s when eating brown rice was considered by some to be subversive. Since then what they do has become known as the Bristol approach. Now it’s part of an NHS pilot project. The focus was on mind, body and spirit. It might sound new age and some of it certainly was. The course was led by a couple of healers who spent most of the time barefoot. Right in the centre of the carpeted room there was a collection of lit candles and flowers which were arranged in a bowl of sand. There was a group of ten of us, all affected by cancer in some way. You’d think that it would’ve been a sad few days but it was inspiring to be with people who’d been through similar experiences. We sat wrapped in soft baby blue blankets in a circle of comfy chairs. We were given talks and taught relaxation techniques including mediation. I’m glad that I went. It made me determined to improve my lifestyle. Despite my concerns that it was all going to be far too alternative, it turned out that most of the stuff was common sense. Essentially it comes down to this. To live well after a cancer diagnosis it’s best to eat healthily, exercise more – a whole lot more, worry less but don’t ignore how you feel, take time out to relax and do things which make you happy. I’m off now to meet a friend to celebrate the end of my chemo. Coffee and cake may well put in an appearance too. I’m going to count all that as something that makes me happy. Whooo hoooooo! Finally it’s over. Yesterday I completed all my cancer treatment. The day started well. On the ward you usually have to share a room with three or four others but I got to turn left instead of right as I was given my own side room. In the world of cancer having the superbug MRSA gets you an automatic upgrade. My friend Tamsin came with me to the hospital. She may not be having chemo but as a surprise and to show her solidarity Tamsin wore a vivid purple wig. Normally part of a fancy dress witch outfit, it was almost like Halloween had come early! Seeing her fake almost florescent hair certainly helped to ease my anxiety. As it was such a big day I wore my Candice wig for the first time. She’s reserved for special occasions and it was certainly one of those. I’m still getting used to wearing a wig again. They’re quite hot and itchy even when you wear a wig liner over your head. My wig liner looks like a foot has been cut off a pair of American tan tights. It has a snug fit. Pull it down over your face and you look like you’re ready to do a bank job. After a couple of hours I had enough of the wig and ditched it in favour of a headscarf. My friend Chantal, the flower girl spent the afternoon with me. She didn’t bring a wig instead she borrowed Candice. Seeing it on someone else was quite surreal. 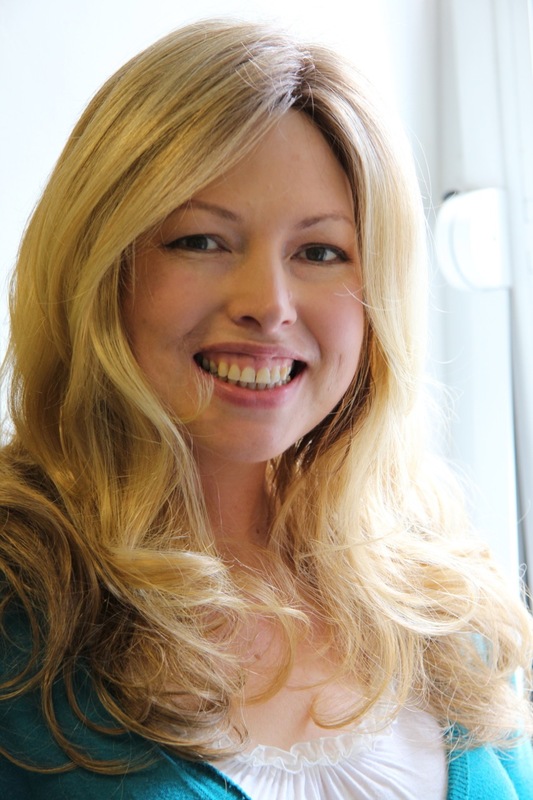 It’s such a massive WAG wig – I’m really glad I picked it! 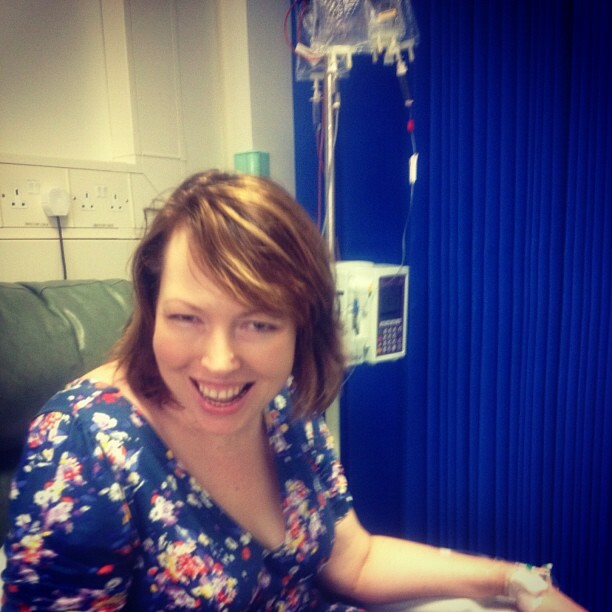 I was so excited that after six months of treatment this was my last ever chemo. The hours seemed to speed past in a blur of coffee, cake and thinking about James Bond. It was his final tour of duty for me. Maybe one day I’ll be able to thank Daniel Craig for doing such a great job. Every chemo I have imagined that a whole battalion of Bonds were shooting the tiny but deadly cancer cells inside me. As always I had several bags of cold clear liquid slowly dripping intravenously into my veins. Then at about 4pm it was all over. No more evil chemo cocktails. We punched the air with delight. I finally got to flick the V sign at cancer. I said goodbye and farewell plus other choice words beginning with F.
Now I had officially beaten this killer disease. But I couldn’t go yet. The chemo is so dangerous that it doesn’t discriminate between the good and bad stuff in your body. It’s now destroyed my magnesium levels. To stop side effects like numbness and tingling in my hands I had one last bag of liquid to give me a magnesium boost. By the time it finished it was past the opening hours of the ward. Some of the nurses had already changed out of their uniforms ready to go home. They didn’t look like medical professionals anymore. As I walked out I realised that they would no longer see me in the same way either. 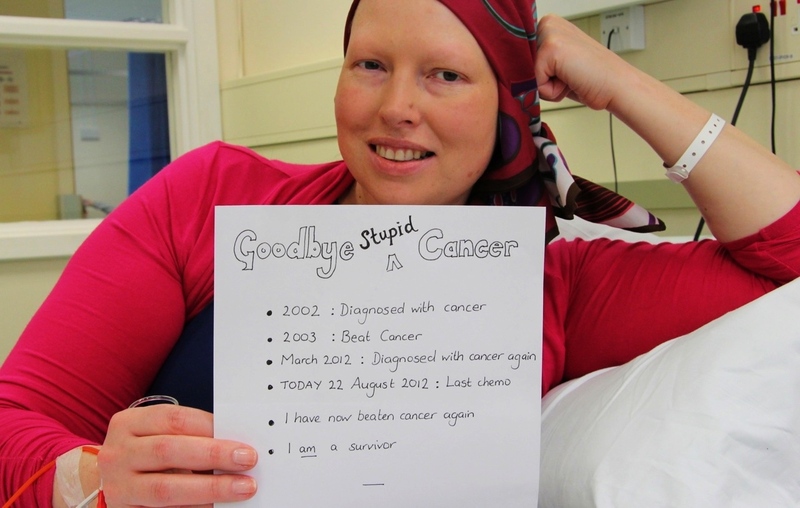 I had stopped being a cancer patient. Outside the fresh evening air somehow seemed much more wonderful than normal. It was an incredible feeling to leave that chemo unit and know that I wouldn’t be coming back again to have my veins filled with poison. Dad and I headed for the car park. We went past a small square of grass surrounded by wooden benches. This is where you go for a quiet cry. It’s what me and my cancer fighter friends call the garden of tears. But at that moment I was full of joy. The days of needing this hidden green space felt like a lifetime away. As we drove us back to the countryside, the sun was starting to set on what had been a brilliant day. The dazzling weather on the motorway home matched my mood. The sky was ablaze with dusky pinks and gold that stretched all across the horizon. Enjoying the view it suddenly struck me – now I’m really going to live. Chemo number four was very different. This time I was sat in a hospital ward with a lively group of chatty women. All of us with various stages of hair loss. 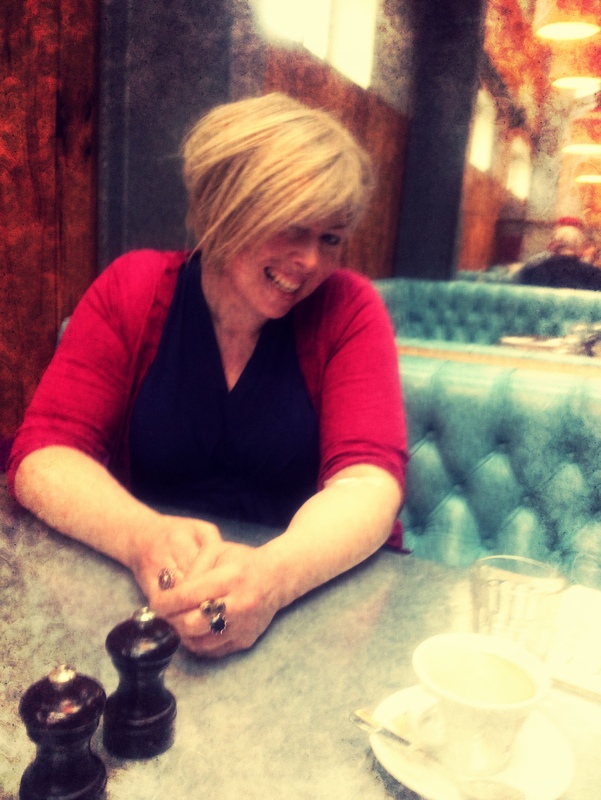 My friend Tamsin joined me for some chemo coffee. It made me realise that maybe it’s not my confidence that’s been effected by all this treatment. It could be that I just spend so much time on my own. With gossip, cake and fancy chocolates, I was soon feeling like myself. The wig-man did keep his promise even though he was almost two hours late. I’d never normally wait that long for a man but this was no ordinary date. Besides I had a needle in my hand and a toxic cocktail on ice. By the time he arrived we were ready for some fun. I had the fittings in a side room that’s mostly used for private consultations. The kind you never want to have. If there’s something that a doctor can’t say to you on the ward then it’s likely to be horrific news. I was so glad to be in there for a happy occasion. I’ve finally come to terms with my falling out hair although I’m going to hold off getting it shaved off. Hopefully not until the chemo is over. I like still having hair while I’m so ill. Somehow it makes me feel not quite so bad. It’s crazy that it’s been so difficult. When I last had cancer I wasn’t nearly so worried. Perhaps because it was another sign that I really did have cancer again. I was determined to have long light brown hair, similar to how I used to look. I wanted to be able to hide behind my old hairstyle. But as I was feeling much more like me and a whole lot braver, it didn’t quite work out like that. I may soon be bald but I’m also going to be blonde and bold. But not like this one below. Woah, I’m back in 1980s. Tamsin had difficulty taking the photos as she was laughing so much. But not at the next wig. Wag-tastic, I had to have this one too! It’s almost like my Barbarella wig, only a bit less of a bouffant. It’s something that could be straight out of the TV show, The Only Way is Essex with a touch of Kate. This will be my going out wig. And it won’t stop there; I’m going to get a whole wardrobe of wigs. When I’m bored of being blonde, I may go red, blue or black. Whatever takes my fancy. So much for fading into the background. But before I could do any of that it was time for my chemo to start. The treatment is getting tougher. After a couple of hours, the drugs made me so dizzy that I had to get into a hospital bed and sleep for the rest of the day. It still feels like I’m a long way off from being well enough to wear the wigs for real. But at least I’m now on the home straight. 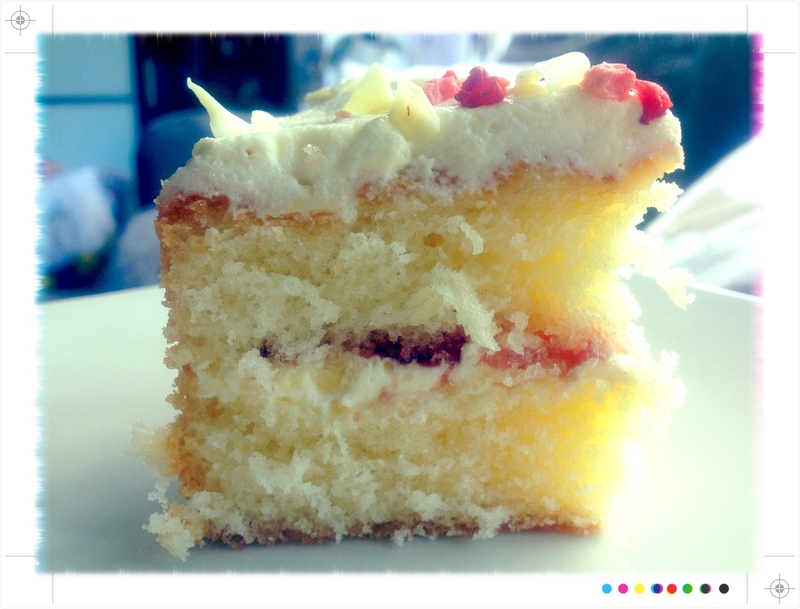 Forget chemotherapy, its cake therapy that’s helping to get me through this. 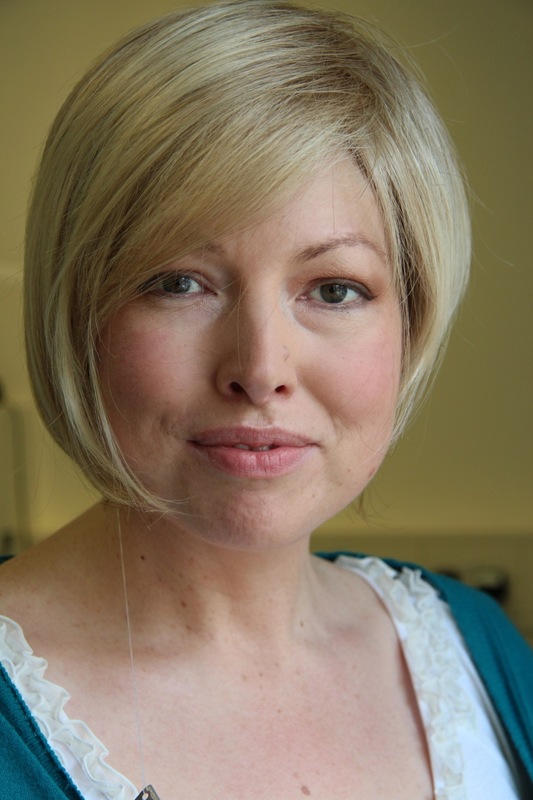 I used to have such a healthy diet and look where that got me – diagnosed with cancer for the second time. Now I’m treating myself to whatever I fancy. If only I didn’t need the evil chemo cocktail every few weeks then I’d being able to properly enjoy this. Cake tends to feature most days, okay, every day. When I’m not stuck in bed and sometimes even when I am, friends and family come over. Much of the time, I’m feeling sick, in pain or too exhausted to leave the house. Many of my visitors come with cake. And I love it. I’ve had white chocolate éclairs topped with multi-coloured sparkles. Cupcakes decorated by my god daughter and perfect meringues made by my aunt. Then there are my chemo coffee sessions. I think I must have tried every type of muffin sold in the hospital. The ones with the lemon curd in the middle have to be the best. Am I worried about what this is doing to my waistline? Not so much. After the first session of chemo, I accidentally lost a stone (just over 6 kilos) without any effort. Now there’s something I never thought I’d say! So I have to be careful about not losing too much. Plus if I get ill my weight could plummet dangerously. As a result of the surgery, my body can’t cope very well with many of the healthy foods like fruit and vegetables that I used to eat. I’ve been told that I should only have small amounts of these things. But cake is absolutely fine. I don’t just get given them. I’ve starting baking. As I’m stuck at home lots of the time, it feels comforting to be able to create something when there’s so little that I’m able to do. It’s not since school that I’ve made a cake and it certainly beats watching daytime TV. I wait until I’m feeling well enough and then start cooking. I’ve only managed to knock up a few cakes so far. One them was a sticky ginger loaf. It wasn’t too bad and gave me a rare sense of achievement. Anyway I had to eat it as it was packed with ginger and so helped to ease my nausea. 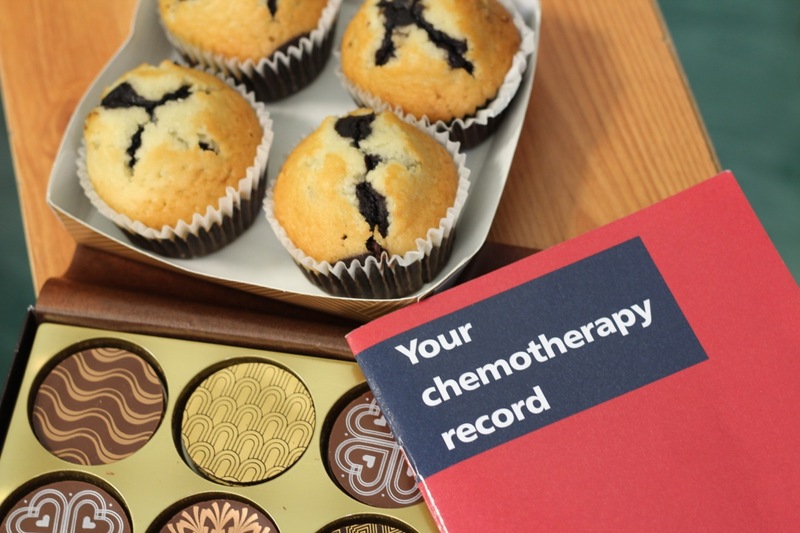 Now that’s my kind of chemo-busting-cake therapy. 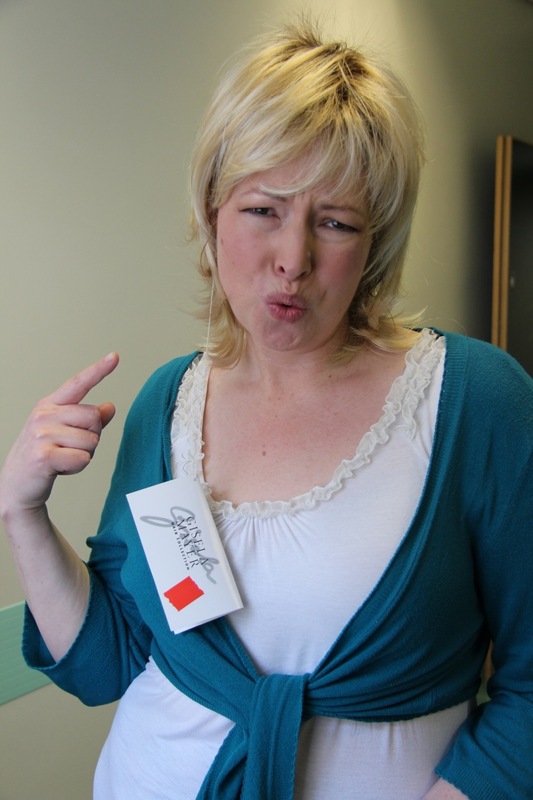 This is where I expected to say something along the lines of… I got my NHS wig today. Hahaha it so was hideous, I’ve been transformed into a 1980’s soap opera super-star. Get a load of the pictures below. But there are no photos as I didn’t get my wig. This morning I woke up to find a halo of hair on my pilliow. It looked horrendous. But I was told at hospital later it’s likely that it’s not falling out, it’s just thinning. Maybe I’ll get to keep most of it after all. So I spent 6 hours wearing the special freezing hat to cool my scalp and attempt to save my hair. Again it was excuriating. My forehead felt like it had frostbite to start with. At least this time it was a bit of a better colour. 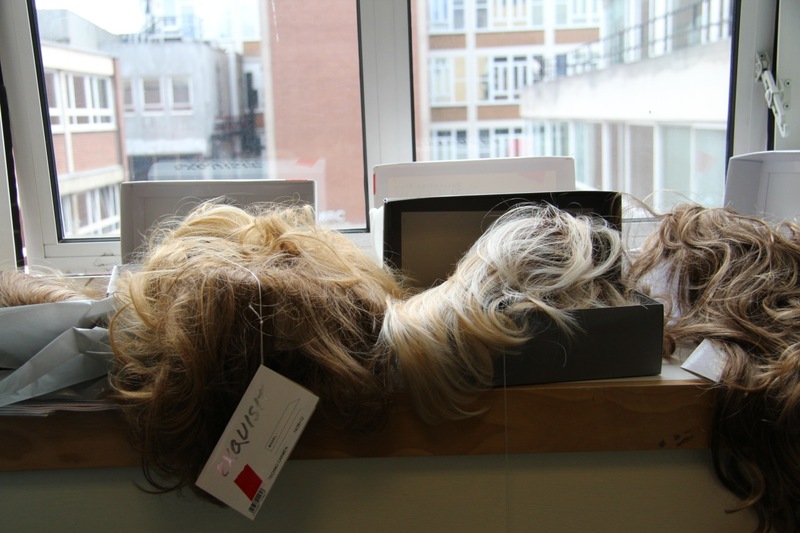 The NHS wig man came in with a selection of wigs for me to try on. He proudly took one of them out of its box and it didn’t look too bad. He agreed with the nurses that I don’t need a wig, certainly not yet anyway. They’ve all been left at hospital. I’ll be able to try them on during my next chemo session in three weeks. They’re locked inside a cupboard on the ward. If I suddenly lose my hair then I can quickly go to hospital for some emergency hair. 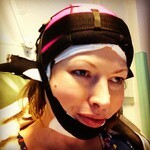 Despite the icy headwear, I actually quite enjoyed this round of chemotherapy. At times it was even fun although I’m not sure I’m supposed to say that. What made it different? Was it the hypnotherapy? Maybe that was part of the reason. It was certainly less painful. I think though it probably had more to do with the great company. Okay and the cake they brought me. Also we were able to watch a film. Sorry James Bond but while you were busy killing any cancer cells, we were watching Batman take out his enemies. The evil chemo cocktail slipped easily into my veins. You have various pouches of clear liquid. I was surprised each time that the machine started beeping to say the current bag was empty. 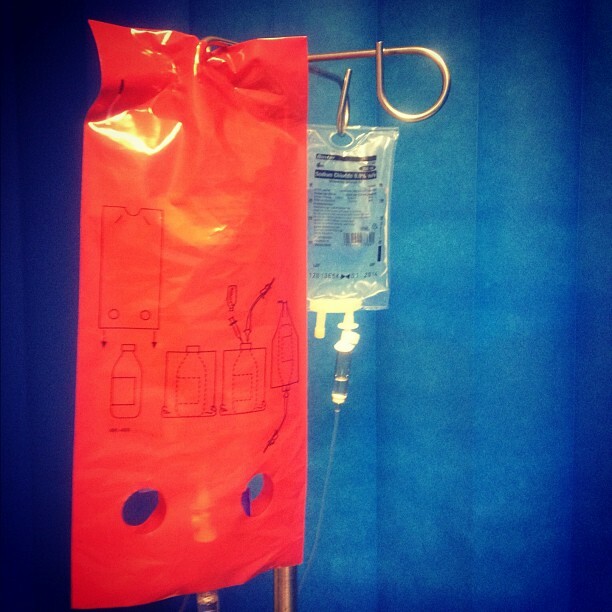 The chemo is light sensitive and it has to be hidden in what I think looks rather like a ‘modesty’ bag. I reckon it wants to be covered up as it’s so bashful that it could well be saving my life. After feeling good all day, the side effects from the contents of that bright bag haven’t yet kicked in. That will take a few days. This time I’m even more prepared. I have my hypnotherapy trances to practise and stronger painkillers. Hopefully it won’t be so awful. © Helen Fawkes. Unauthorized use and/or duplication of this material without express and written permission from this blog’s author and owner is strictly prohibited.Excerpts and links may be used, provided that full and clear credit is given to Helen Fawkes and the blog with appropriate and specific direction to the original content.